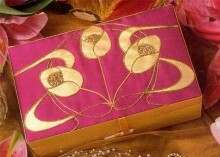 The removable lid insert is removed, covered with your fabric and replaced to make a great gift. We have lots of kits that include the jewellery box, or make up your own design, or use it to complete a UFO! Click the button below to add the Jewellery Boxes with Removable Lid Insert to your wish list.